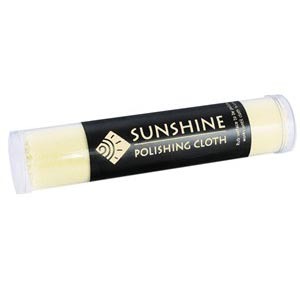 The original YELLOW Sunshine® polishing cloth safely cleans and polishes jewelry, gold, silver, brass, copper, mirrors, coins hub caps, bells, badges and most other metals, leaving a deep, long-lasting luster. 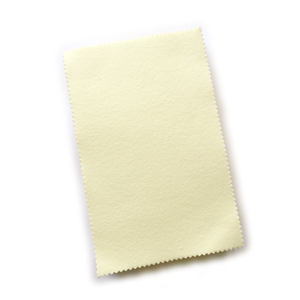 We also now carry a cloth that is slightly softer than the yellow. It is called Sunshine® soft. 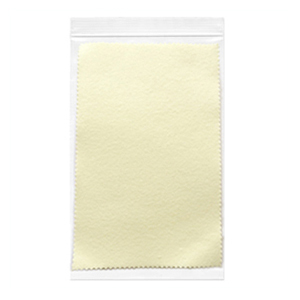 They come in bulk, in various quantities and in 3 sizes. Small: 2 1/2" x 3 1/2" or Medium: 3 3/4" x 5" or Large: 5" x 7 1/2". You can use them at your bench or give them out to your customers with your business card. Things you could polish with these polishing cloths: bracelets, necklaces, church bells for the bell choir, coins, jewelry, instruments, police badges, earrings, broaches and so much more... Directions for use: Rub surface to be polished with medium pressure. Special polishing and cleansing action of works until the cloth is completely darkened. Do not wash the cloth. Made a Japan. We offer free shipping if you order online, product total is over $50, with a shipping destination within the United States.